The 2019 KX250 arrives, unchanged, in the middle of a dry spell. Aside from some sporadic wins and Justin Hill’s Western Regional 250 Supercross in 2017, the Kawi just hasn’t been winning at the highest level—not like it used to. This is, after all, the winningest bike in Pro motocross. Yet, no one at Kawasaki is too concerned. What’s going on? 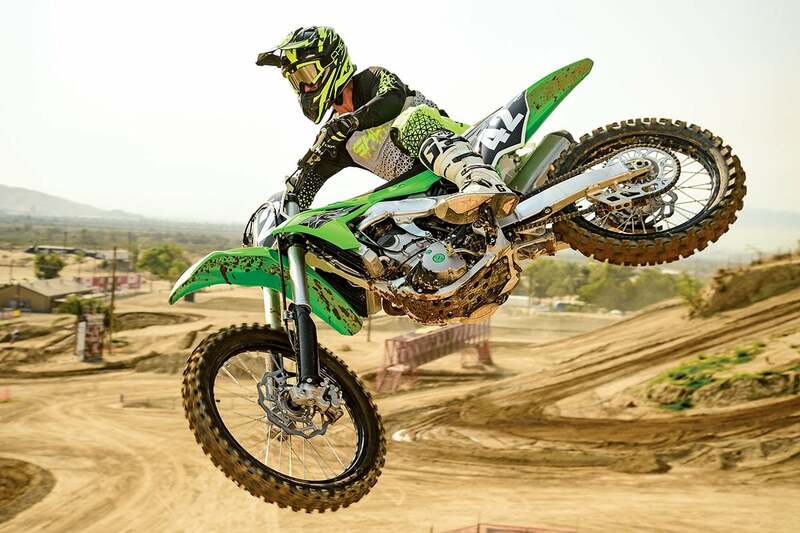 Kawasaki has no changes for the 2019 KX250 other than the removal of the “F” suffix. 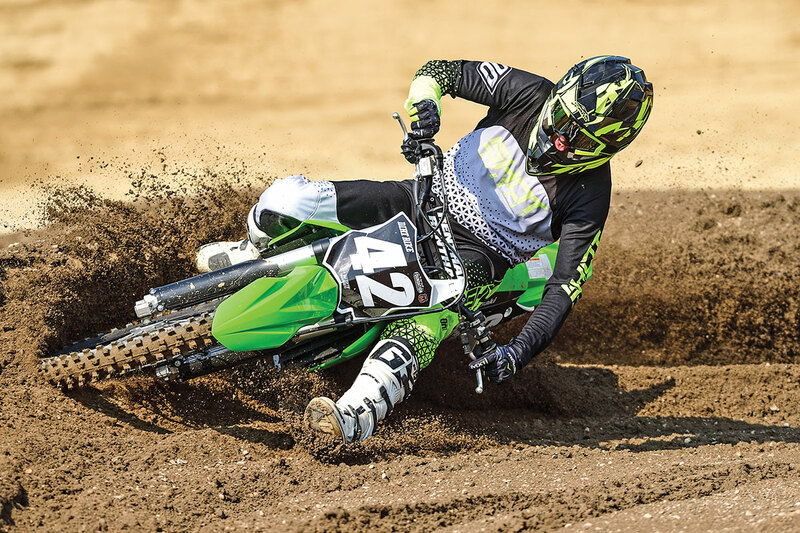 The current KX250 is as good as it has ever been. In 2016, the chassis was redesigned and it became the lightest of the Japanese 250 four-strokes. Then, Kawasaki went after a little more power for the 2018 250. The compression ratio was changed, the angle for the injectors in the throttle body was changed; it got a new intake cam, a new head pipe and a redesigned intake tract. All those things made the bike better in incremental steps. What’s changed is the rest of the 250 class. The KTM and Husqvarna have electric start and much more peak power. The Honda was redesigned from scratch last year with electric start, and it got more peak power too. This year the Yamaha YZ250F has electric start and, you guessed it, more peak power. And while the 2019 Suzuki is still a mystery, it will be mostly new. Where does that leave the Kawasaki? Is it just a placeholder for the next big thing out of the Kawasaki factory in 2020? 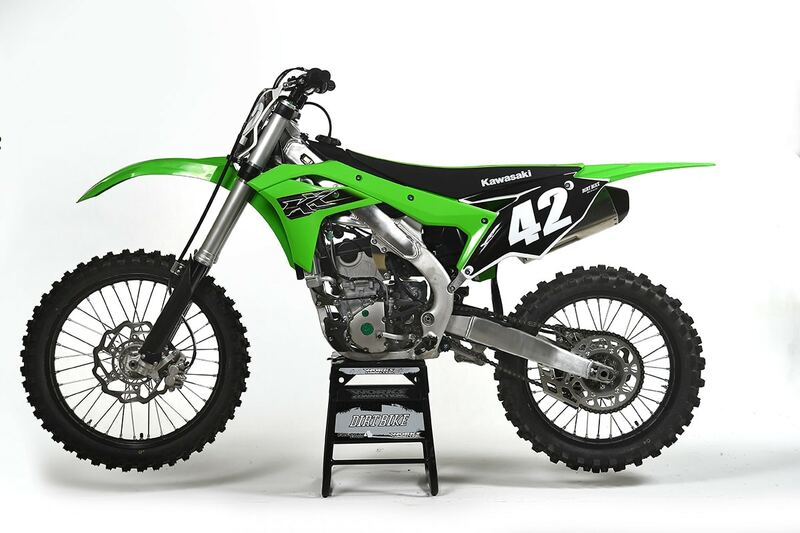 For 2019, the KX450 got a new front brake, but the 250 is unchanged. No. In stock form, the Kawasaki can no longer compete in the contest for pro-level power, but that’s not necessarily a bad thing for the rank-and-file riders in the other classes. Before obsessing on what the KX doesn’t have, you need to consider what it does have. First of all, the bike has had a coil-spring fork since 2011—through the entire era of air—and it remains one of the lightest forks available. The Showa SFF uses a single spring in the right side with a preload adjuster, and all the damping adjusters are on the left. That and the lack of electric start contributes to the bike’s overall weight, which is 221 pounds without fuel on Dirt Bike’s legendary balance-beam scale. That’s around 7 pounds less than the Honda or new Yamaha but still a little more than the KTM or Husqvarna. Kawasaki still places a big premium on having adjustable ergos. The bike has four handlebar positions and two footpeg positions. The KX also uses color-coded electric couplers that allow you to adjust the power delivery. If you want to explore more than the three options allowed by that system, Kawasaki sells a handheld FI calibration kit for around $700. This is an electronic device that links into the KX’s brain and allows you to adjust the fuel delivery and the spark advance at different rpm levels and throttle openings. Now, the Kawasaki is by far the lightest 250 from Japan. It’s noticeable from the first moment on the bike. 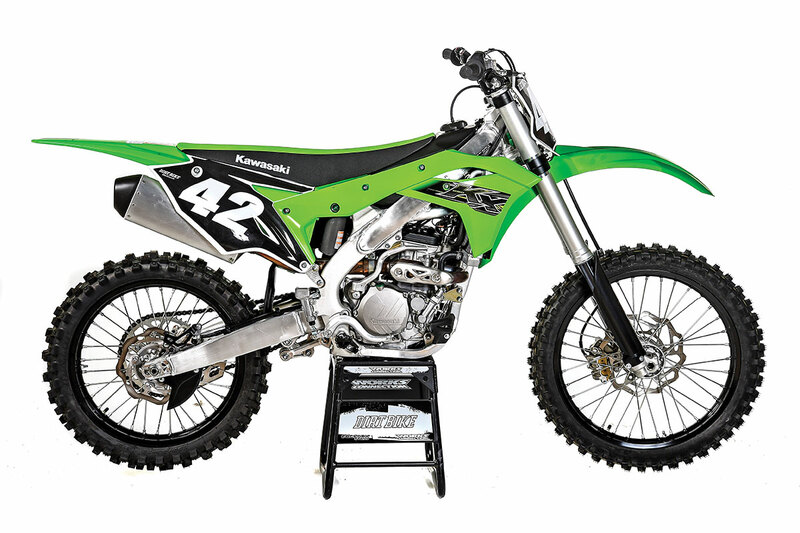 A few years ago the KX was in the running as the most powerful bike in the 250 four-stroke world. Now, it has a different role. The KX is the easiest to ride, and it probably has the sweetest powerband. It’s the only 250 that you don’t have to scream. The KTM and Husqvarna make all their power over the 10,000-rpm mark, whereas the Kawasaki is much more throaty down low. In Dirt Bike’s 2018 250 shootout, all the bikes were tested on the FMF dynamometer. It clearly showed that the Kawasaki had the most power between 6000 and 10,000 rpm. After that, the show was over. The Kawasaki leveled off below 40 horsepower and flatlined all the way to the rev limiter, around 13,500. The Honda and Yamaha both carried farther, and the KTM and Husqvarna carried much farther, eventually finishing with a 5-horsepower advantage. For a pro, that’s the end of the story. 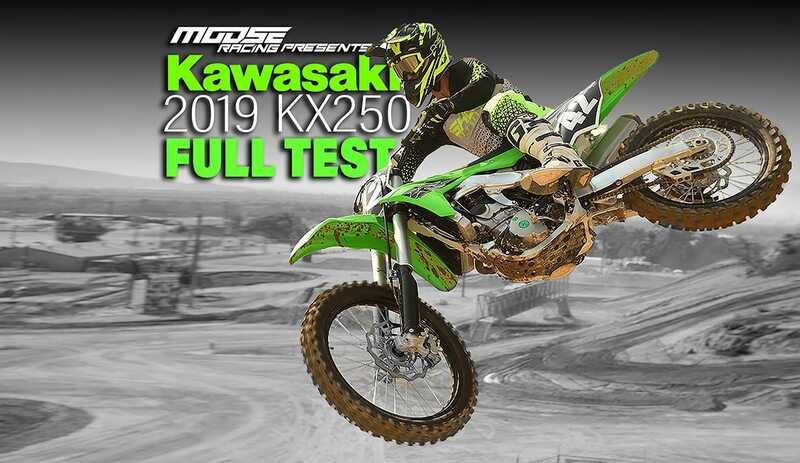 There’s every indication that the 250s of 2019 will have an even greater horsepower advantage over the Kawasaki. The trick for riders of those bikes, of course, is learning to use that horsepower advantage. Many riders don’t stay on the throttle all the way to the rev limiter. Novices and beginners generally don’t and wonder why the lowly, under-powered Kawasaki is out-pulling them. The low-end advantage for the KX means you don’t have to shift right on queue. The big hill that dominates the national track at Glen Helen is a perfect showcase for the KX’s torque. All 250 riders have to shift at some point on that hill, and pulling the next gear is much, much easier on the Kawasaki. What about pro riders? Many of them still ride the KX250, but most have motor work. The benefit of a bike that’s been around for a number of years is that aftermarket parts are easily found. Aftermarket cams virtually don’t exist for the KTM and Honda motors. Almost all aftermarket exhaust systems work wonders for the KX, whereas most of them do very little for the Yamaha. Pro Circuit has been building KX motors for a very long time, and it’s clear that their team riders have never suffered for want of holeshots. After the frame and bodywork changes that came in 2016, the KX250 has been one of the best-handling bikes in the class. It feels like a feather. Part of that is the weight advantage over the other Japanese bikes, part is because it’s so narrow. Riders who are used to other bikes sometimes say the KX is too narrow and that they can’t grip the bike properly with their knees. Kawasaki riders roll their eyes when they hear complaints like that. Having a bike that’s this easy to throw around is always an advantage in the long run. A more legitimate complaint is that the Kawasaki can be a little hyperactive. It’s a very responsive bike, and on a rough track, things happen quickly. The Showa SFF fork is a little busy. Most riders try to calm it down with more of everything—a couple of clicks on compression and rebound, plus a little more preload. That levels the bike out, but takes a toll in ride quality. To use a worn-out phrase, the SFF fork suffers from mid-stroke harshness in stock form. Still, the SFF is a decent unit. Ride quality isn’t its strength as much as tunability and simplicity. The rear suspension, on the other hand, is solid. The bike likes 105mm of preload, and if the rider’s weight is in the happy zone between 140 and 170, life is good. The complaint list for the Kawasaki hasn’t changed much over the years. The KX is a little loud, and it has an annoying pop on deceleration. The clutch has a great feel and an easy pull, but it will start to slip after two or three rides. The brakes aren’t especially strong. We would love to have the front brake from the 2019 KX450, which is amazing. And as much as we like the $700 FI calibration tool, it was seriously upstaged by Yamaha’s Power Tuner app, which costs $700 less and is easier to use. All that would be forgiven if Kawasaki could have found a little more horsepower this year. It’s probably not a surprise to anyone that a new electric-start KX is expected for 2020. The market demands electric start, and the KX is generally changed every four years, so a new bike will be right on schedule. It will probably be heavier and might not have as much low-end power. If that isn’t what you want, then getting a KX250 now would make sense. It’s your last chance. Fuel tank capacity: 1.7 gal. Weight, no fuel: 221 lb.